•	Cut the onion finely and fry it with ghee until it becomes yellow. •	Add the liver and fry it for 10 minutes, then add water and salt and then leave the mix until it boils. 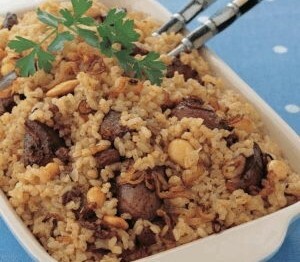 •	Wash rice well and add boiled water, liver and onion to it then leave it until it becomes cooked. •	Serve it hot beside the yoghurt and salad.